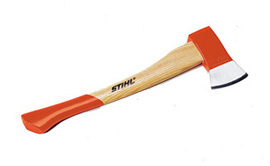 Hatchets, axes and splitting tools made from traditional materials with superior workmanship. Stainless steel meets durable wood. This perfectly engineered range in proven designs is functional and robust with impressive durability. 50 cm, 1,250 g. Highly suitable for light splitting work. With ash handle.